Made a start on my killteam! 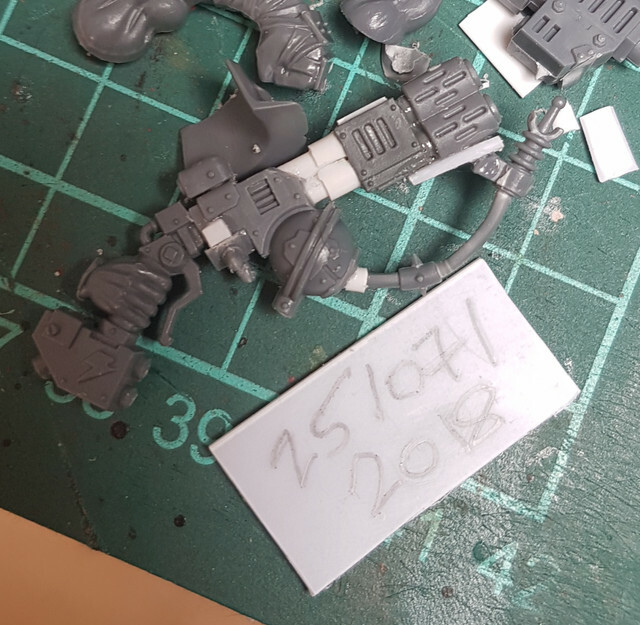 Badmoon Mek/Spanna leader, still in two minds about loadout... any tips? 1. Get an initial card shot with something showing the time/date! 2. Straps. It's probably already on your plan, but it really sells the model if you have straps holding those tools in place! Well, I'll just hafta take the boys when I go next week and see what I can do, but effectively I think I'm just here to make up numbers at this point. Getting some work done while i can. All da boyz in Da Kollectors will have their own fetish about what they like to collect (steal). Pictured are Boots, who likes to purloin his enemies' footwear, and the mob's yoof, Boney, who collects, um.... well, yeah. They will all be getting a green stuff backpack in which to carry their ill-gotten gains. @Garr - did you choose what to give the Spanna? Looks like he can have a KMB or a rokkit launcha - seems to me any Bad Moon worth his salt would want a big flash KMB. I'll have a dive in my bits boxes and see if i can come out with a functional looking KMB! Great news! I heard back from Bits of War/Kromlech and they're in! More on that later. I'm also revising the initial post date card rule! It's only going to be needed for entrants who are not posting their WiP. So you only need it if you are waiting until the end! @Garslag, the retro is fierce! Reminder! Follow the thread to make sure you don't miss updates! Here's a helpful article from GW on recruiting your kill team! Right to left: Fragga. All my lootas were supposed to be straight out of the box, but that was before i found a multi-melta laying around. Old skool kustom kombi-weapon, anyone? Gazza - collects shiny fings. Dunno how well they can be seen. With all those shiny fings to be kept shiny, he needs a polishin' grot. Not sure how, but I'll give the grot a polishing rag in his right hand. Couldn't believe how well that lasgun fit into his other hand! From left: Boots again, he now has a recently pilfered boot in one hand and another hanging from his belt at the back. I'll green stuff a backpack too fill with them later. Skrappa: most of the character on this guy will be in the painting. He pinches bits of his enemies' combat kit, so I'll paint him like a those old 2E death skulls whose clothes were patched together from in different camo schemes. Bazza: he collects helmets. I'm pretty sure he's about to use that beakee helmet as a spitoon. 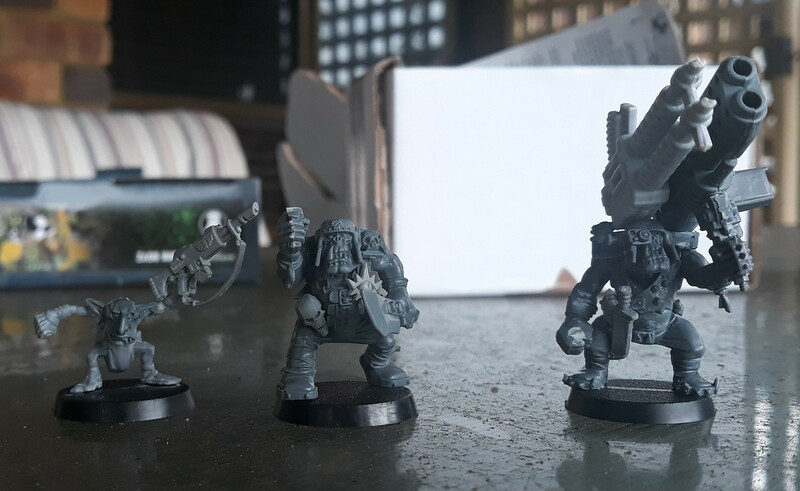 Still to build: 3 x grots, 1 x nob, 1 x gunner with looted heavy bolter, i mean big shoota. Waiting on some guns to come in the mail so i can finish off Gazza (Shiny fings) and Skrappa. Get da word out ladz! Right now da big prize is a deff dread. Kromlech wants to know how many ladz are mekkin about and I can't tell them 4!!! I'm also adding a fresh box of grotz to the most creative Kill Team. This, like the main prize will be upgraded as we gain more kontestants so get ta shoutin ya gits!!!! While I still don't have time to participate myself, I did clear it with an admin at the Bolter and Chainsword to link it in a couple places there do perhaps that will help participation. Thanks, i posted it to the Facebook group for Gorkamorka but they deleted it.. because it isn't Gorkamorka.. Shoot. I wish I'd seen this sooner. Best of luck to all the entrants. Maybe 4tonmantis would consider extending the deadline to make it easier to get a few more contestants? Maybe give Flaming Deth a shout too... sounded like he was keen but put off by the tight deadline. I'll throw my beret in the ring, I'm reading the rule book as we I type and will put together a kill team for orks. Surprise surprise it will be blood Axe kommando heavy. Second post updated with Skarnir's name and the prize progression ladder! I'm waiting until tomorrow night before I send the number of signups to Kromlech to see what support they're adding, so get the word out! 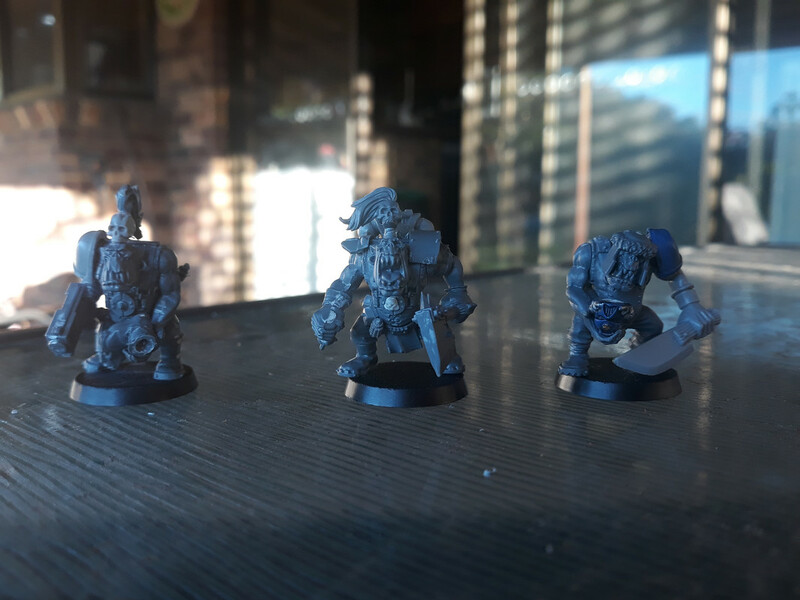 I've been tinkering around and have rolled up my own kill team finally. I'm struggling with getting things packed up for my move and trying to juggle in a build but I'm sure I can get it. A word of advice to anyone who is stuck at the team creation phase.. Figure out your mission and squad quirks.. Either ignore them or use the roll as an idea to build the character. For me, my boys are obsessed with destruction and are pyromaniacs at the tip of the spear.